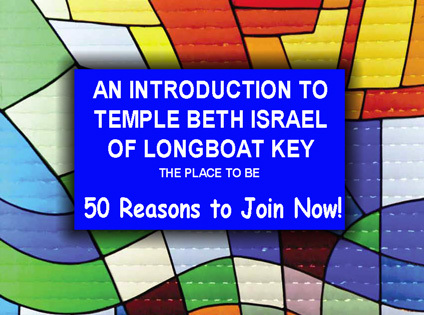 Thank you for your interest in Temple Beth Israel membership. to any person of the Jewish faith and the spouse or live-in partner of that person, regardless of their religious background. Single and family memberships are available. Many of our members are still “snowbirds”, some of who still maintain their Temple affiliation up north but chose to join so they might participate fully in the social and religious activities of the Temple. and share common interests, whether social, religious or intellectual. Temple Beth Israel continues to build its programs and activities to enrich and satisfy those interests. What We Offer You is a Temple … a place to pray, to learn, to socialize, to meet and to participate. We have Shabbat Services every Friday night and Saturday morning led by Stephen L. Sniderman, D.D., assisted by our Cantorial Soloist and renowned Temple Beth Israel Choir. Our Institute of Continuing Education includes everything from Hebrew to biblical studies, from contemporary history to writing one’s memoirs. Lectures by experts on current events, outreach and social issues are an integral part of the Temple calendar. Our Beth Israel Women , Men’s Club and Women On Our Own complement the program with socials, holiday celebrations and entertainment throughout the year. The Temple is supported by member dues and other voluntary pledges and contributions. us the many benefits we offer. Should you purchase tickets for the High Holy Days, the full purchase price can be applied to your first year’s Temple dues. For further information, call our office, (941) 383-3428 or email info@tbi-lbk.org.